Fulfill your destiny by traveling into the past to save a village from an undead cult in this densely-packed level 2 adventure. A review copy of “The Sunken Village of Little Corth” was provided by the publisher. Find more DMs Guild Reviews on my website and YouTube channel. Time-travel often makes for fun, if confusing stories. I don’t see them too often in tabletop RPGs as they could require a lot of linear storytelling. “The Sunken Village of Little Corth” is a level 2 adventure that sends the PCs back in time to thwart a time-traveling necromancer and fulfill a prophecy that they’re already a part of. The adventure includes lots of fun little ideas that tie the past and present together, but it’s a densely packed read and requires the PCs to work in perfect sequence with the DM. The adventure is 40-pages long, but feels even longer thanks to the relatively tiny font and huge walls of text. My kingdom for more paragraph breaks! Time-travel plots are often confusing as it is, and the physical design of the adventure doesn’t make things any easier. It’s divided up into three parts, with a nice summation of each part at the beginning. A lot of rich, realm-agnostic lore is provided, with easy replacements for the commonly used Forgotten Realms setting. Part 1 introduces our heroes to their swampy setting, and sets up an intriguing plot hook when they find statues of themselves as ancient heroes from over 2000 years ago in the town of Pathem. Even more intriguing – though the heroes saved the nearby village of Corth, they perished in the process, and the village continues to rise from the marsh and bring waves of undead to this day. 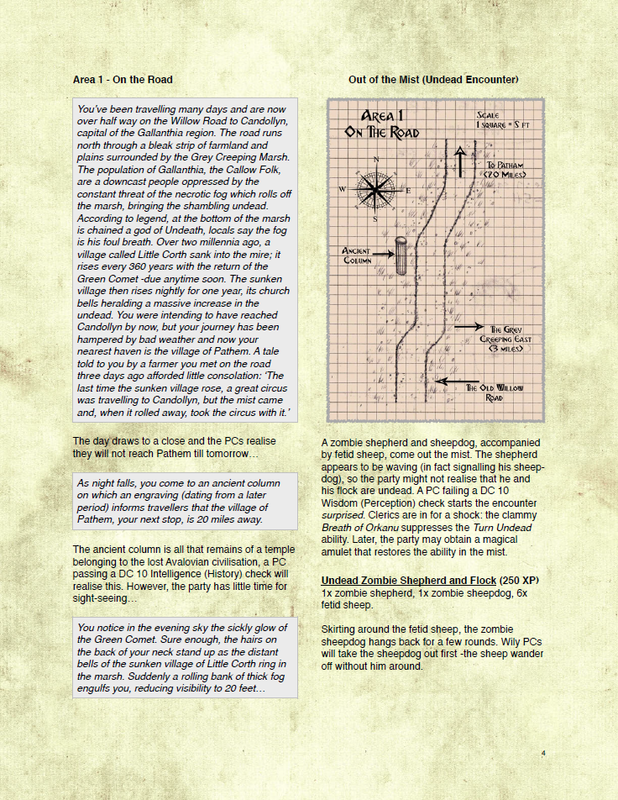 Part 2 sets the PCs on a literal railroad gauntlet of encounters in a single-file path through the undead-filled swamp. They find magical items that aid them in their quest, before being accidentally transported into the past by the necromancer – what had already fought the heroes in the past and was trying to Terminator-them before they could reach him again. Confused yet? The story seeds are quite clever and fun, as some of the items even have the PCs’ names on them, alluding to the fact that they’ll acquire them again in the past. Part 3 finally brings our time-travelling heroes to the titular village over 2000 years ago, when undead-worshiping cultists arrived in town to do bad things (surprise!). The leader, Vordan, has a magical device called a Time Twister, which rips open a portal into the past. His goal is to change the outcome of an ancient battle even further back in time, which frankly has no bearing on this adventure one way or the other. The PCs have to thwart his first attempt, which transforms him into an undead ghoul. He vows to use the Time Twister to prevent them ever having come here in the first place by traveling into the future – which unwittingly backfires and transports them into the past. Ah ha! In the mean time the PCs’ goal is to find all the artifacts they found in the future/present: a holy amulet, a silver arrow, a spell scroll, and vials of holy water. The intention is that the PCs then place the items in the exact places they found them in the future/present. If they do, they’ll be given rewards (or less punishment) during the final battle. Of course if they refuse, they’ll have those items, and it creates a time paradox as the items aren’t there in the future-present, even though they were. It’s all a bit weird. 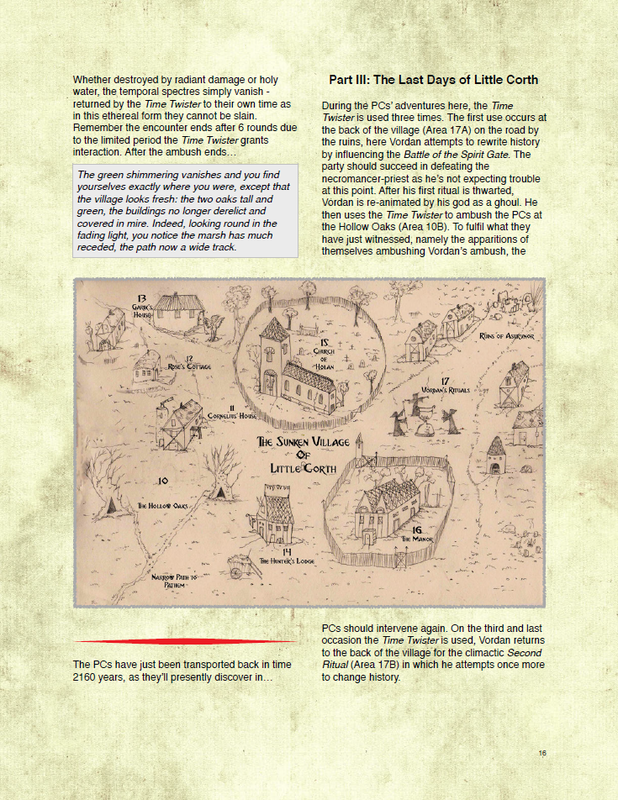 The PCs are meant to find the items and explore around the village in between Vordan’s Time Twister events, including exploring the large manor house filled with cultists and zombies. and solving an over complicated star chart puzzle in the Orrey that takes about four pages to explain. It’s indicative of the overall adventure being way too wordy (I know, I should talk). I appreciated the sketches of the town and location of events, though none of them are usable battle maps (the closest being the top-down manor house grid map). If the PCs don’t return the items for their future-selves, or refuse to, the final battle can get quite dangerous as more foes are added to the fight. Remember, this is a level 2 adventure! Assuming the PCs are successful, they’re cursed by the villain to die if they try and leave, and immediately saved by a special elixir from a villager, rendering it all a bit pointless. The idea is they wake up 2000 years later inside the coffins at Pathem. You can see now why time-travel plots are tricky things to pull off, and even trickier when the DM is only one part of the overall storytelling of an adventure. If you’re group is okay with being railroaded almost the entire way through, there is definitely potential for memorable story moments and shocking reveals. If all goes according to plan, the time-travel plot and mysteries create a neat story tying together events and choices from the past and present. Very compelling plot hook and start to the adventure. Extremely linear, and requires the PCs to make certain choices for the story to play out correctly. Plain font and huge walls of text make it a difficult read. The Verdict: It’s excessively linear and a borderline chore to decipher, but “The Sunken Village of Little Corth” showcases lots of memorable story moments in a unique time-traveling tale.